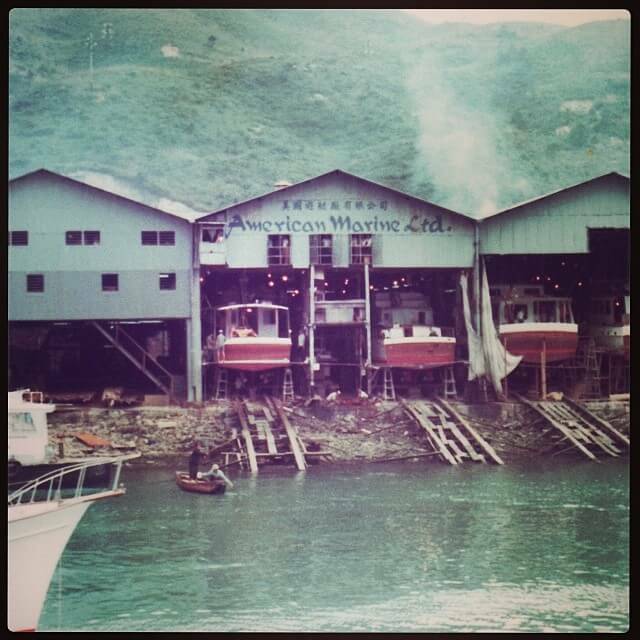 HF: Our article, Carolyn Quincy AKA Francis Marion – luxurious boat built at American Marine boatyard, Junk Bay, introduces a Hong Kong shipyard that I hadn’t come across before. Many thanks to Thomas Sposato (TS) for sending a large amount of information about the shipyard and those who worked there. The following powerpoint, linked below, The Legend of Grand Banks, was apparently put together by Shing Kong and Robert M Lane. Shing Kong’s father was a Mr Kong who worked at the shipyard. 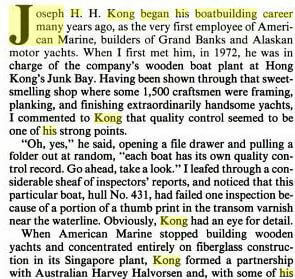 I wonder if this is “Joseph Kong, former General Manager of American Marine Company”, as mentioned in the Source 3 below? The powerpoint includes numerous photographs of the yard including many of the skilled company craftsmen at work. The latter begin at page 31. I would be delighted to hear from the authors of this fascinating insight into the yard both to further credit them, but also to ask see whether they have further information about Mr Kong and/or the shipyard which can then be posted on this website. I can be contacted through an added comment below this article. Hugh Farmer. “More than 50 years ago, on Mok Cheong Street [Ma Tau Wai/To Kwa Wan] next to Eastern Cotton Mills, was a soft drink bottling plant managed by the founder of American Marine, Robert Newton. “In 1962, Robert J. Newton and his sons, John and Whit, were running a custom boatyard on Junk Bay in Hong Kong called American Marine, Ltd. Father and sons built heavy sailboats and big motor yachts, to designs by the world’s top marine architects – Sparkman & Stevens, William Garden, Nat Herreshoff, Ray Hunt and others. That year they commissioned Kenneth Smith, another well-known marine architect, to design a 36 foot, diesel-powered cruising boat. Spray was launched in 1963 and a year later the Newtons abandoned their custom yacht building to focus on producing the first of a line of boats that would be known as Grand Banks. This article was first posted on 30th December 2015. I own “Alnilam,” a Magellan 35, hull #3514 launched 1965 at the Newton yard. She is going strong. I think she’s one of the finest cruising designs ever launched. The slide show was a wonderful treat. I have all the log books since her launch but extra pix are always great to see. Thank you! We purchased a 45 foot Harry Scheel designed motor sailer built by American Marine In 1964 and delivered to Honolulu.We sailed the boat to Australia in 2007.